Ald. Mark Tendam (6th) speaks at an election night gathering last week. Tendam — who was trailing businessman Steve Hagerty by 129 votes — conceded to his opponent on Sunday night. Ald. Mark Tendam (6th) conceded the mayoral race to businessman Steve Hagerty on Sunday, capping off a roughly six-month long election season that included a rare primary and a slew of contentious legal challenges. In a statement provided to The Daily, Tendam expressed his support for Hagerty and pledged to help him fulfill campaign promises. 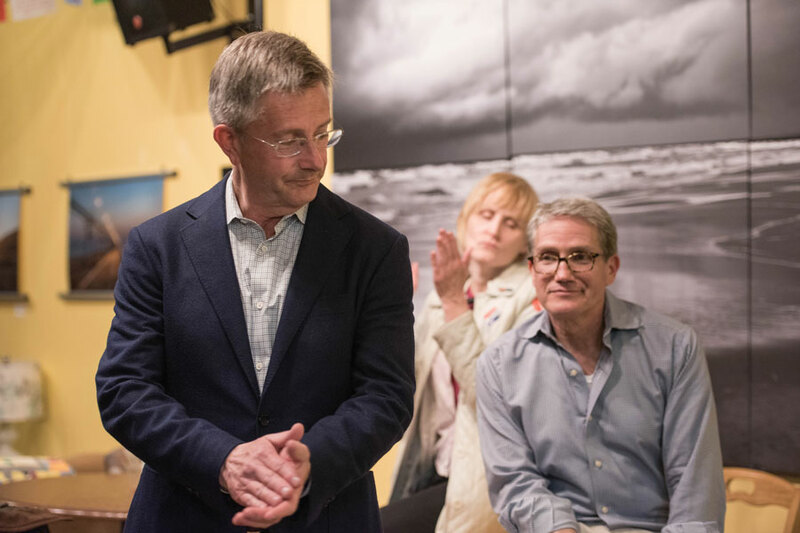 Tendam — who trailed his opponent by just 129 votes as of Friday afternoon — encouraged voters to celebrate the successful Evanston/Skokie District 65 referendum, which will help alleviate rising costs associated with an uptick in new students over the past decade. Evanston had the second highest turnout rate — roughly 36 percent, or more than 18,000 voters — among Cook County municipalities with contested mayoral or presidential races. As of Friday, that rate was significantly higher than that of the last contested election in 2009, when only 10,375 people voted. Tendam said he decided to concede after updated results came out Friday, which narrowed the already close race to 129 votes. The slight improvement in his direction was not enough to make a “long shot” viable, Tendam said. At the end of last week, about 450 mail ballots had not been received by election officials, Cook County clerk communications director Nick Shields told The Daily in an email. However, those ballots may never be returned because voters have the option to discard their mail ballot and vote on election day; others may choose not to send them back at all. In an interview Sunday night, Tendam said he would remain invested in the issues he campaigned on, particularly those of affordability and police-community relations. Throughout his eight years on City Council, Tendam has championed affordable housing and more recently chaired the Human Services Committee. The local businessman, who ran with the current mayor’s endorsement, attributed this year’s high turnout in part to the District 65 referendum and the November presidential election, after which “more citizens are looking to engage in local politics.” But he stressed that no single theory could explain the turnout, or why one candidate beat out the other. During his campaign, Hagerty focused on three major issues: expanding economic development to all neighborhoods, strengthening youth development to reduce violence and maintaining diversity through affordable housing. Hagerty, a lifelong emergency consultant, moved to Evanston in 1999 so his wife, Lisa Altenbernd, could attend graduate school at Northwestern’s School of Education and Social Policy. After settling into the community, he founded a local firm that currently employs more than 100 people across the country. In February, Hagerty told The Daily he wanted to move away from his business and focus on helping the community. Since he began considering a mayoral bid two years ago, Hagerty said he has built a strong management team to run day-to-day operations. “I can continue to have a part-time role here with my company, but it affords me the flexibility that I need to help the city,” Hagerty told The Daily in February. The new mayor will assume his role on May 8, city manager Wally Bobkiewicz said.